Displaying page 1 of 218. 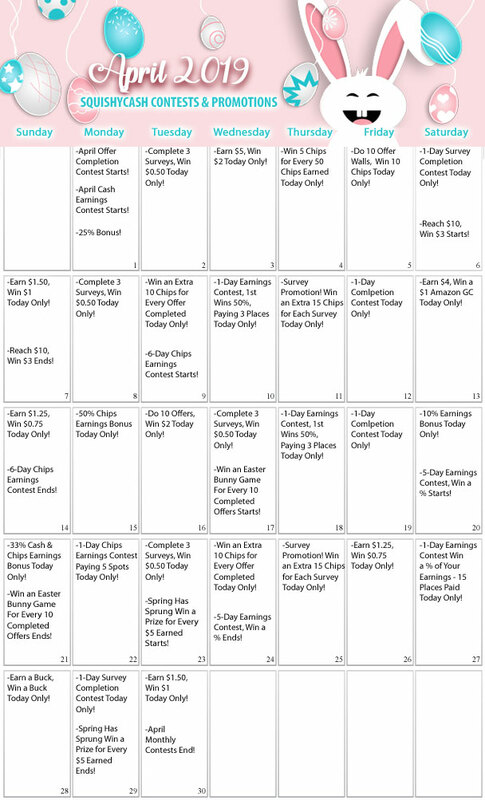 33% Cash and Chips Earnings Bonus! April 21 only. Ends at 11:59pm EST. You will get a 33% bonus on top of all your cash and chips offer earnings! For example; you earn $9 and 90 chips doing offers and win an extra $3 and 30 chips on top! The Easter Bunny Game Promotion! April 17-21. Ends at 11:59pm EST. Each time you reach 10 approved offers, you'll be sent a prize to your SC inbox! These prizes may contain cash and/or chips! At the end of this promotion, a few hours after midnight, you will receive your prize(s) to your SC inbox. To see what you won, simply open the inbox message and click the image. If you win a prize, you must reply to the message stating the prize won, and once verified, we will credit your account within 24 hours of your inbox response. You can win an unlimited amount of prizes during this promotion! April 20 only. Ends at 11:59pm EST. April 20-24. Ends at 11:59pm EST. The top 5 members who make the most in cash offer earnings will win! 1st place wins a 33% bonus on top of their cash offer earnings. 2nd wins 20%. 3rd wins 10%. 4th wins 5%. 5th wins 3%. April 19 only. Ends at 11:59pm EST. The top 3 members who have the most offers approved will win! 1st place wins $1. 2nd wins $0.50. 3rd wins $0.25. Excludes Offer Walls, Survey Wall, and Clicks. April 18 only. Ends at 11:59pm EST. April 17 only. Ends at 11:59pm EST. Reach 10 Approved Offers, Win $2 Promotion! April 16 only. Ends at 11:59pm EST. Reach 10 approved offers and instantly get $2 added to your account balance! This promotion is only good for your first 10 approved offers. You can only win once. Excludes Offer Walls, the Survey Wall, and Clicks. Earn $1.25, Win $0.75 Promotion! April 14 only. Ends at 11:59pm EST. Reach $1.25 in offer earnings and instantly get $0.75 added to your account balance! This promotion is only good for your first $1.25. You can only win once. Earn $4, Win a $1 Amazon Gift Card Promotion! April 13 only. Ends at 11:59pm EST. Earn $4 in cash offer earnings and get a $1 Amazon gift card sent to the email address listed in your SC account profile. The gift card will be sent to your email address a few hours after midnight. This promotion is only good for your first $4. You can only win this bonus once. April 12 only. Ends at 11:59pm EST. April 11 only. Ends at 11:59pm EST. Each time you have a survey approved, we'll instantly add 15 extra Chips to your account balance! So, if you complete 3 surveys during this promotion, you'll win an additional 45 Chips! Winnings will be added instantly to your account balance as the surveys are approved. April 6 only. Ends at 11:59pm EST. The top 3 members who have the most surveys approved will win! 1st place wins $1. 2nd wins $0.50. 3rd wins $0.25. Do 10 Offer Walls, Win 10 Chips Promotion! April 5 only. Ends at 11:59pm EST. Complete 10 Offers Walls and the Survey Wall and win 10 chips. Winnings from this promotion will be added to accounts instantly! This promotion is only good for your first 10 Offer Walls. You can only win once. Includes all Offer Walls and the Survey Wall. Win 5 Chips for Every 50 Chips Earned Promotion! April 4 only. Ends at 11:59pm EST. For every 50 chips you earn doing offers, you'll instantly get 5 chips added to your account balance! Earn $5, Win $2 Promotion! April 3 only. Ends at 11:59pm EST. Reach $5 in offer earnings and instantly get $2 added to your account balance! This promotion is only good for your first $5. You can only win once. April 2 only. Ends at 11:59pm EST. March 31 only. Ends at 11:59pm EST. March 30 only. Ends at 11:59pm EST. Earn 18 Chips, Win 18 Chips Promotion! Earn 18 chips by doing offers and instantly get 18 chips added to your account balance! This promotion is only good for your first 18 chips. You can only win this bonus once. March 29 only. Ends at 11:59pm EST.